With all of the uncertainty coming out of the dog food industry, and the amount of recalls circulating around chicken jerky treats, I have decided that the best way to avoid any risk is to try to make them myself. Here’s a quick and easy recipe I’ve managed to dig up. It works well and Bear is ecstatic to be getting chicken jerky as part of his treat pantry again. Slice the chicken with the grain. This will help make the jerky even chewier for your dog. The slices should be very thin, about 1/8″ to 1/4″ thickness. Bake for approximately 2 hours (see note below). Remove from oven and cool on a wire rack until completely cool. Cut strips into bite sized pieces. Storing: These homemade dog treats may not last long enough to be stored because they are so good. But, just in case they do, store them in the refrigerator for 3 weeks. Freeze any remainder for up to 8 months. Be sure to read our tips on storing homemade dog treats for more information. Checking – The baking times will vary due to difference in ovens, temperatures and meat size. 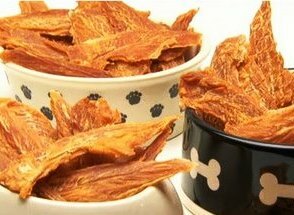 Your jerky treats should be firm and dry, not at all soft or spongy. It is safer to go a little extra dry and firm than for the meat to be underdone. Cutting – Once the treats are cool, it’s easier to cut them with kitchen scissors or a pizza cutter, than a regular knife. Thanks to the Dog Treat Kitchen for the recipe!